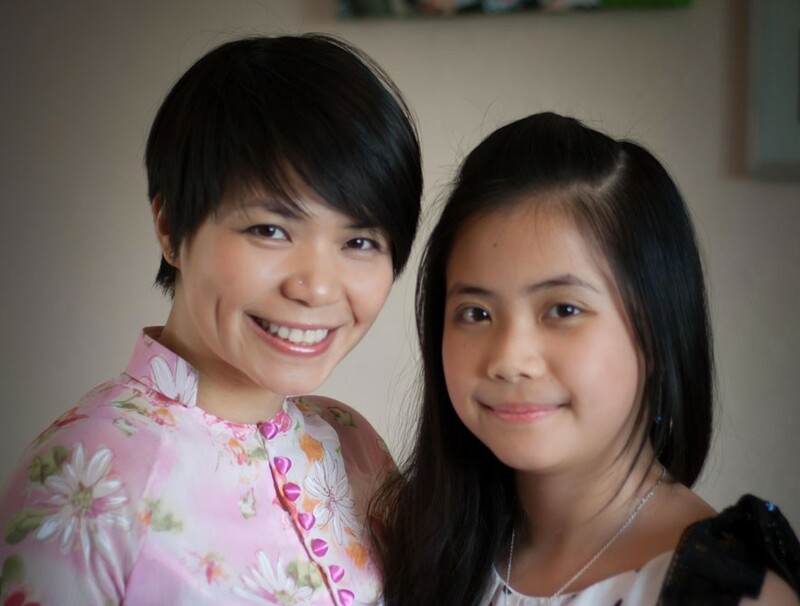 Huong Phan is one of the most amazing moms I know—glamorous, cheerful, smart as a whip, and totally unfazed by the challenges life has thrown in her path. She is on the verge of earning a doctoral degree in computer science and has a software engineering job offer waiting for her on the West Coast when she’s done. She has done all of this in a foreign country while raising her smart and sassy daughter on her own, teaching herself the art of photography, cutting her own hair, and creating one of the most successful Latin dance studios in Pioneer Valley, Massachusetts. Yes, you read that right. This petite, Vietnamese computer geek Solo Mom is a hot salsa dancer. She fell in love with the art as a young international student in Australia, then she brought the salsa scene back to her hometown of Ho Chi Minh City. “I just called people together and taught them, because I wanted to dance. My students from those days have gone on to run big dance studios—they dance better than me! But they always treat me like someone special when I go back,” she says, laughing. More impressive still, she went on to do it all over again—starting from scratch and creating a new dance community. In 2006 she moved with her three-year-old daughter to pursue a master’s and PhD at University of Massachusetts in the small university town of Amherst, Massachusetts. It was not easy being a Solo Mom halfway around the world. In fact, she returned to Vietnam after finishing her master’s degree in hopes of rescuing her failing marriage. In 2010, when divorce became inevitable and her advisors called her back to Amherst, she reclaimed her place at UMass and embraced a new life in this vibrant university community. When she could get out to dance, people asked her and her dance partner where they taught. “We said ‘we don’t teach’ a few times, and then we looked at each other and said, ‘well, why not?’” In October 2011, Amherst Salsa was born, launching many new dancers in the Pioneer Valley. Phan was lucky, in a sense: Her divorce was the sad but civil ending of a long and loving relationship, and she found support in a community that values the diversity that she and her daughter bring. But she also made great use of her good fortune by working hard, drawing on friends, building community, and taking time to enjoy beauty and express joy through dance. And people, you really should see her dance.